Finnair is the largest airline of Finland and the fifth-oldest in the world being founded in 1923 by Bruno Lucander as Aero O/Y. The airline’s code AY originates from this. AY stands for Aero Yhtio which means ‘company’ in Finnish. The first flight was on 20 March 1924 from Helsinki to Tallinn, Estonia on a Junkers F13 aircraft. From its Helsinki base Finnair flies to Asia, North America and an extensive regional network in Europe. The domestic and intra-European flights are partly carried out in conjunction with Flybe Nordic, operating a fleet of Embraer aircraft. In 2013 Finnair transported more than nine million passengers to over seventy destinations across its network. In addition to its oneworld partners, Finnair has codeshare agreements with nine other airlines including Aeroflot, Bangkok Airways, Czech Airlines, Icelandair and TAP Portugal. The Finnair fleet is made up of Airbus A350’s, A320-200’s, Embraer 190’s (operated by Flybe Nordic) and a range of other Airbus aircraft. Their fleet is one of the youngest in Europe. Finnair Plus is Finnair’s frequent-flyer program. Membership tiers run from Basic to Silver, Gold and Platinum, and there is a Junior tier exclusively for minors. Silver, Gold, and Platinum members enjoy benefits such as premium check-in desks and priority boarding. Finnair operates Lounges at Helsinki and Stockholm. The remaining international destinations are served by partner airlines. Read our review of the Finnair Helsinki Business Class Lounge. Business Class on international flights offers fully-flat beds, signature menus and a high quality amenity kit. Passengers will also be able to take advantage of priority check-in and boarding, priority security (where available), access to Business Lounges, extra baggage allowance and on most Airbus aircraft there is a dedicated snack bar. Retrofitted Zodiac Vantage Seats on selected A330’s and A340’s have a massage function and transform into a 78 inch fully-flat bed, plus there is a 12 inch personal entertainment screen and electricity socket. Read our review of Finnair Business Class. 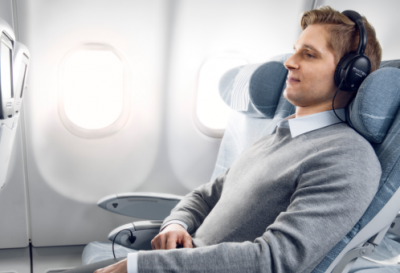 Economy Comfort is Finnair’s new premium economy product, it is not a separate class but more of an upgraded economy product. Economy Comfort seats are located in the first five rows of Economy providing 35 inches of pitch (four inches more than standard Economy seats) and a comfier headrest, plus noise canceling headphones and a comfort kit. 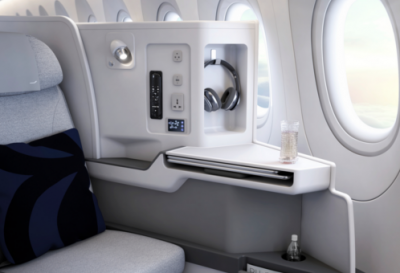 These seats are free to Finnair Plus and OneWorld Elites, and passengers with a full fare Economy ticket, and available to all other customers for a fee. Economy Class passengers enjoy meals, snacks and beverages including sparkling wine. 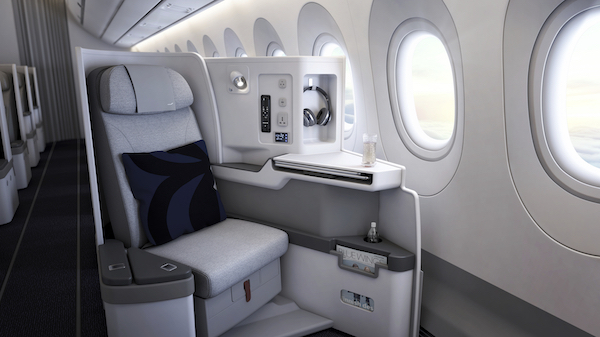 Seats are equipped with a foldable table and personal in-flight entertainment system. There’s a designer touch with Marimekko pillow and blanket on your seat and an electricity socket. On most European flights in Economy Class, a cold salad or sandwich is served, together with non-alcoholic drinks. Alcohol and additional food is available for purchase. Domestic flights as well as shorter European flights have snacks for sale and free non-alcoholic drinks. Airbus A330 and Airbus A340 aircraft have a personal entertainment system on all seats.